Note: This is not a relaxer. This is not a keratin treatment. This product contains no formaldehyde or perm solution. No harmful fume, no formaldhye, and no dramatic color fading! Hair Beautox Freezes years of Damage. Fortify and revive limp, lifeless, frizzy hair. Hair Beautox by De Fabulous is a revolutionary treatment that uses botanical ingredients to give you the hair you’ve always dreamed of. This is a reparative system geared to make hair smooth & manageable. Relaxers break and re-bond the molecular structure of each follicles core. Hair Beautox penetrates deep into the core, depositing Cysteine protein, natural oils and fruit acids to strengthen the hair from the inside out. Smoothing, hydrating and sealing the hair on a strand by strand level making hair smooth, manageable and beautiful. Imparts lubricity, which results in less friction during combing or brushing, making the hair less prone to breakage. 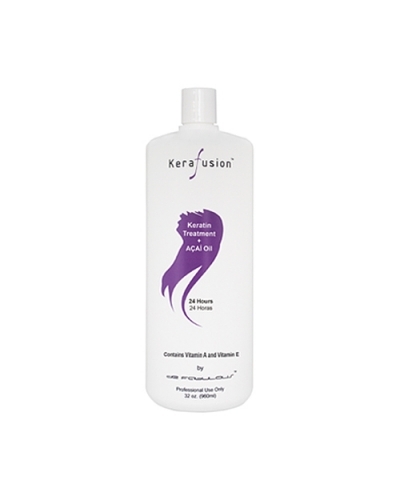 The most convenient Keratin treatment comes in the form of Kerafusion with Acai Berry extracts. Kerafusion + Acai 24 hour can be easily washed out after just one day. Acai Berry extracts, Wheat Germ oil and Olive fruit oil leave the hair nourished and healthy, while the unique combination of Keratin, Shea butter, Chestnut extract, Vitamin A for manageability and Vitamin E for wellness deliver strength and shine like no other! Our deep-cleansing, sulfate-free formula of Clarifying Shampoo removes build-up and allows for Kerafusion to take to the hair most effectively. The original De Fabulous solution to unruly curls and frizz. Kerafusion contains no harsh fumes or smoke during the application and activation processes.Enriched with a comprehensive protein complex, Kerafusion delivers manageability and strength to all hair types. Keratin and mineral oils mixed with Shea and Cocoa butters leave the hair moisturized and shinier than ever!